Recently I was able to get Mexican President Enrique Pena Nieto to sign a baseball for my collection of signed baseballs from world leaders and heads of state. His signature is very hard to acquire as he does not like to sign autographs but through a lot of perseverance with his inner circle – I was able to convince him to sign a baseball for my collection. He also sent me a photo (via email) of him signing the ball as well as a letter stating that he signed the baseball and it would be overnighted to me shortly. As promised the signed baseball arrived within a couple of days. 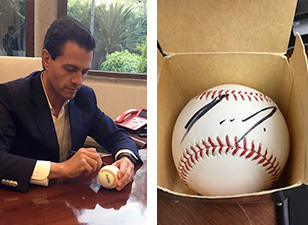 The baseball was signed beautifully but much to my dismay – President Enrique Pena Nieto also stamped a logo of Los Pinos (The Mexican equivalent to The White House) all around the baseball. It was messy and the stamp did not take fully so the President took a sharpie and wrote out the name Los Pinos and printed his name beneath it as well. As happy as I was to have his signed ball in my collection – I knew I would need to get this replaced as it did not conform to the way all the other leaders have signed baseballs. I contacted his key staffer and explained the situation about the ball being not in such great condition with all the extraneous writing and stampings. I requested that the President kindly sign a replacement baseball but I was quickly alerted to the fact that President Nieto normally doesn’t sign autographs, he is quite busy and therefore I would have to accept this baseball. Additionally I was told that the President tried to make it special for me by adding the stampings and such. I called the staffers numerous times in Mexico and explained how much it would mean to have a better example of his signed baseball in my collection so that my upcoming museum exhibits would feature a better specimen of his signed baseball. They advised me that it was unlikely that the President would sign another ball but I should go ahead and send another one explaining the situation. I did exactly that and also executed a major faux pau in autograph collecting – I sent back the originally signed messy ball. I knew I was taking a chance that I might never get the President to sign another ball and then I would have to beg them to send me back the original signed ball with the stamps – if by chance it was still hanging around their office. After calling and emailing the President’s staff every month – I was told, “We did not forget about your request but the President is very busy.” This was happening for a period of 10 months when I finally contacted them and said – can you please send back the original baseball so that I would at least have that in my collection for the upcoming museum exhibit. The next day I received a telephone call and email that President Enrique Pena Nieto has indeed signed a replacement baseball for my collection without adding any stampings or such. I was thrilled!